Macaulay Culkin seems to have been another victim of child actors who simply can't cut it once their cuteness factor has deteriorated and they become teenagers. After the Home Alone films made pots of money, trying to get Culkin into other, similar roles seemed like a good idea, but by the law of diminishing returns, almost none of these were successful, although Culkin's younger brothers have done some good work, notably Keiran who appeared in the recent Signs. 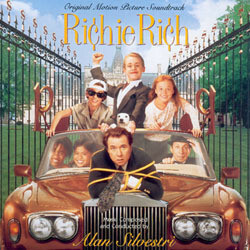 Richie Rich is, I think, based on a comic book character, but as often happens, a brief cartoon strip really can't be expanded to an hour and a half and the result is a sub Chris Columbus outing of kids outsmarting nefarious (but incredibly dim) adults. I think Alan Silvestri probably stands as the most consistent comedy composer working Hollywood today, only Marc Shaiman comes close, but I think Silvestri has the edge as he is more adept at avoiding sentiment. 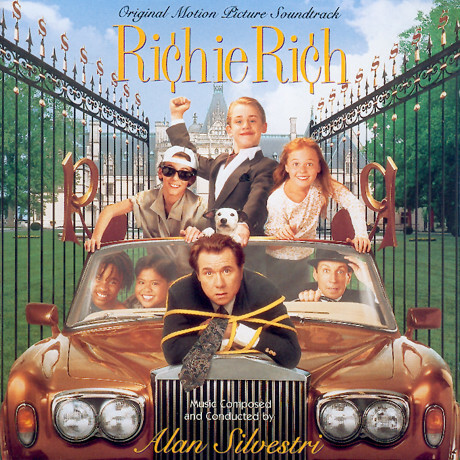 Richie Rich is a fairly slight effort, but as usual, Silvestri delivers a few good melodies and a charming, memorable string phrase that he shapes depending on the pace of the scene. The entire opening track, I Have a Son is based on this motif, backing the longer line main theme in a most fetching way. While the analogy might seem strained, it is remarkably close to an ultra cheery version of the Psycho opening credits music, the string backing is very insistent, but is occasionally tempered by the smoother melody, also in the strings. A couple of brass fanfares break through to add a little pomp. The ensuing tracks are more or less variations on the opening and only with Something's Missing does Silvestri add some darker, albeit with a comic edge, elements. With Bomb Surprise, the music suggests more in favour of the good guys and the original, chirpy material starts to take over and this continues toward the brass, but surprisingly cheeky and almost sentiment free Richest Kid in the World. Although there are other melodic ideas, the string runs and main theme form the basis for almost all of the tracks and consequently it does become a touch repetitive at times, despite Silvestri's good attempts at variation in pace, mood and context. Not as witty and inventive as Mouse Hunt, but a cheerful and energetic half hour of pleasing entertainment.